Here's our adorable new puppy. 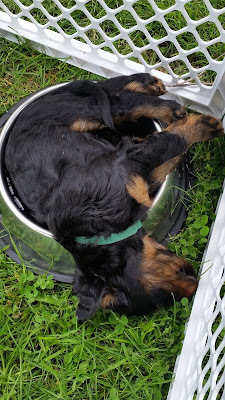 She is a Gordon Setter, 8 weeks old. She looks right at home next to my design wall in the quilt studio. My favorite place to be in the quilt making process...time to hand sew the binding!!! It is the first quilt for me to get quilted in eight months...you know...that little diversion in Paris this winter kept me from my midarm. I asked myself several times while quilting this one, "Will I ever get past the bumbling stage?" I'm sure the long stretches between my machine quilting events are the real problem so hopefully I am going to overcome that obstacle now. This time I ran into a new problem...getting my bobbin to wind. Midway through the quilting I ran out of bobbin thread. When the new cone came in the mail I promptly tried to wind a bobbin and failed...the thread would almost immediately slip out of the tension disc. I took a break and several hours later my mind came up with the one thing I had done differently this time...I had forgotten to put the little white netting cover over the thread cone. That made all the difference. Such a little thing..but it was important. Hopefully the first quilting session of the season has the bugs in my memory worked out...at least a few of them. While waiting for the bobbin thread to arrive I finished the Eldorado Canyon quilt I bought from a kit at Hancocks of Paducah. I love this quilt! The designer is Chris Hoover of Whirligig Designs. She used a Tonga Treat Strip pack called Bluegrass for her fabric color palette. I learned so much from this kit. I would never have used a "background" with so much color and large sized stamped motifs thinking it would muddy the look...but not so. There are actually two background fabrics and the bear paw blocks with the sharp points are sew with a more traditional tone-on-tone background. My husband has been home for the month of July. We were invited by friends to fly-in for dinner at their lake side cabin. Here's our Cessna 206 float plane at the cabin dock. The main cabin. This lake is only accessible by float plane during the summer months. (In the winter...maybe by skis on the plane once the lake is frozen.) It is a convenient 30-minute flight from Anchorage. Pretty nice cabin! And the weather was very cooperative for our grilled steaks on the deck. We stayed in their guest cabin. Cute! The outhouse is in the woods behind the cabin...just follow the little trail to the right of the tree. I suppose I should have taken a picture of it...oops...next time. They assured me no bears or signs of bears had been spotted this summer...good to know since I didn't want any surprises when I got up at 4 a.m. to trek to the outhouse. The main cabin has running water from the lake for showering and there is a filter under the kitchen sink for drinking water. They also have a biodegradable toilet in the main cabin. Our little cabin had a queen and twin bed with a wood stove. Thankfully, we had mild temperatures and didn't need to fire up the wood stove. So fun to be back to our Alaska neighborhood. I picked up four more Alaska Row by Row blocks last week. I got kits for all of them except the first from Quilt Zone. All of them are SEW cute! No internet last night...so happy it is back on this morning! My order of Bottom Line thread came in yesterday. Of course I didn't just order the thread...I also bought a new ruler for my midarm. I think this lack of bobbin thread was a serendipitous event. The new ruler is just what I need to make my next round of straight line grid of stitches in all the ovals....funny how that happens! I was planning to just use an awkward rotary cutting ruler. The latest batch of ornaments backed and ready for Christmas. All of these were on perforated paper of different colors so I had to swap out floss color to stitch them to the felt backing. And the fronts of these two Santa ornaments are ready to sew to the backsides. The center section of El Dorado is in one piece. I started making flying geese for the borders. I messed up and only cut a third of the green triangles. Plenty of fabric so it's just a matter of cutting more. The strips will be sub-cut for tree trunks. I didn't have any success finding the Bottom Line thread in gray at any of the local quilt shops...but I did buy my first "Row by Row" kit. No one could resist this quintessential Alaska design...and it was in batiks. If you aren't familiar with the "Row by Row" nationwide quilt program...just check out the Alaska Facebook page for the event...too many extremely cool rows to collect just in this state! Two more nights of work on my Santas. Next up is adding boots. These two are going much quicker than the first two in the kit. Bet I'll really whip through the last two! And just a little more news about the puppy...this isn't the one I am getting from the litter but it is such a funny picture. The puppies went outside for the first time last week and one of the males decided to take a nap in the water bowl. I think I will inquire if he is still available...I think he would fit perfectly in our home! Puppies are like potato chips...one really isn't enough. I have been humming along on my midarm...making good progress. Then I realized I was almost out of the gray Bottom Line thread that I am using for the bobbin. July 4th weekend...there was only one quilt store in the Anchorage area open and they were out of the gray color. I have ordered a new cone online but will check out the stores that will be open tomorrow and see if I can find a spool to get me through a few days. Never fear....there is always another project to tackle. I have the two center rows pieced. Once I get all of the corner sections put together I will add them to the center rows. It is slow going when sewing all these points that meet up. Love the look of this design but when I design a quilt I always think of ways to avoid matching so many points to each other. In this case I am basting every intersection first and checking before doing the final stitching. It took several nights to stitch felt backings to all of these cross stitch ornaments. I have a few left in the pile to stitch on the backings. But all of these are what I got done since September of last year. Close to finishing up another trio. I like to outline the teeth and add the beads all at the same time...my "assembly line method." Another few nights of working on these Santa ornaments. I wanted to share my latest furniture addition. These patio Adirondack chairs are made of the synthetic wood like our Trex decking. They match our deck ! Very comfortable and impervious to our extreme climate. But the best feature is these are folding chairs so they can be stored away for the winter. They are incredibly heavy...very well made. Love them! If you are looking for some Adirondack style patio furniture, check out the line from Phat Tommy. They come in lots of great colors. I wish I was sharing some really awesome completed quilt pictures but no...just more furniture. But I do take credit for my DIY project of refinishing old furniture. Sure wish I had a "before" photo but I didn't think about that. Here are the two nightstands refinished and in place. I had my handyman make a new headboard from a photo I found on the internet. And here is the matching dresser. The original furniture pieces had these real wood-faced drawers but the bases were particle board covered in fake wood laminate. Years ago I painted the bases an army green for one of my son's camouflage color schemed room. The bases were in pathetic shape by the time we got to our new house but the drawers were in awesome shape...no sagging drawer bottoms. So I talked with my handyman. He made new bases plus added four-inches to the bottoms of all the pieces so they are a much more up-to-date height. They look pretty nice! Perfect for a guest room. And...a silly project that took so much more time than it should have. Lights for the nightstands in our master bedroom. I spent hours looking on the internet. There are very few places to shop for stuff like this in Anchorage. They couldn't be taller than 28-inches and I wanted a three-way light switch that would go up to 150 watts. I greatly whittled down the window of available lamps with those two stipulations. Oddly enough...I found these in a Lowe's home improvement store. All criteria met. And they look pretty nice. I thought I'd share a few of the refinishing/new finishing projects on my list. This set of arm chairs and table need to be refinished to a dark color and then reupholstered. I have the new fabric...have had it for almost two years now! It is going to cost a small fortune to get them reupholstered so I am going to tackle the refinishing and save on that expense. But of course I have to do the refinishing before I send it to the upholsterer. I had this wood screen made to hide the toilet in our master bath. I am planning to paint it. This bathroom rug will be my color inspiration for the paint scheme. I haven't quite decided what I 'm going to do...that is always the biggest dilemma of any creative process. And our second guest room. I'd like to stain all of these pieces to a darker color also. And figure out what to do about these tiny night stands. I had a headboard made by my handyman to complement this furniture. It's in the garage...waiting for me to tackle it. The only needle work action has been some embroidery work on my latest Bucilla project. Five nights have gotten me this far. I am now ready to turn on my midarm and do some real quilting!